This is the time of year when Chris and I fight about Halloween candy. I want to buy Sour Patch Kids and Skittles for trick-or-treaters because I hate Sour Patch Kids and Skittles. Chris wants to buy Reese’s Peanut Butter Cups and Snickers bars because he loves Reese’s and Snickers. So basically, I don’t want to eat the Halloween candy and Chris does. So I thought maybe this year we could compromise a little and I’d make some healthy-ish candy for us and we can hand out Skittles to the kids in the neighborhood. Compromise! That’s what marriage is all about: compromise and me getting my way. I’ve never done a Halloween post before, but I had the idea to try to make a healthy version of Ice Cubes and I figured this was a good time of year to tackle it. You know those little German hazelnut chocolates that melt in your mouth? Chris loves those and when I was thinking about them a few weeks ago, I realized that they must be made with coconut oil–that was the only way to explain their melty yumminess. And after a little bit of Googling, I realized I was right! So knowing they were made with coconut oil, I figured it would be really easy to make them myself. …and I was wrong! I couldn’t figure out how to replicate the exact texture of Ice Cubes. But I did accidentally stumble upon the best vegan chocolate fudge I’ve ever tasted. I’ve had vegan fudge before, made with nut butters, and while they’re good, the texture wasn’t quite like fudge. And, of course, the fudge tasted like nut butter. This fudge is different–the texture is creamy and rich and it melts in your mouth, just like fudge made with dairy butter. It doesn’t have that buttery finish that real fudge has, but it does have a faint coconut flavor that makes up for it. I was super excited about this recipe and so was Chris, but he gave me the side-eye when I told him it was healthy. Okay! Fine! It’s healthyish! It’s not an apple or a head of broccoli. But the ingredients in this fudge are healthy. You shouldn’t eat a whole slab of it if you’re counting calories, but you’re better off eating a square of this fudge than a square of traditional fudge. Rich vegan fudge made with hazelnuts, raw cacao powder, and coconut oil. Combine all of the ingredients in your food processor and process until mixture is completely smooth. This might take several minutes, kind of like when you make nut butter. Be patient! Transfer the fudge mixture to a small rectangular baking dish that’s been lined with parchment paper and use a spatula to spread it in an even layer. Sprinkle tops with fleur de sel or cacao nibs, if using. 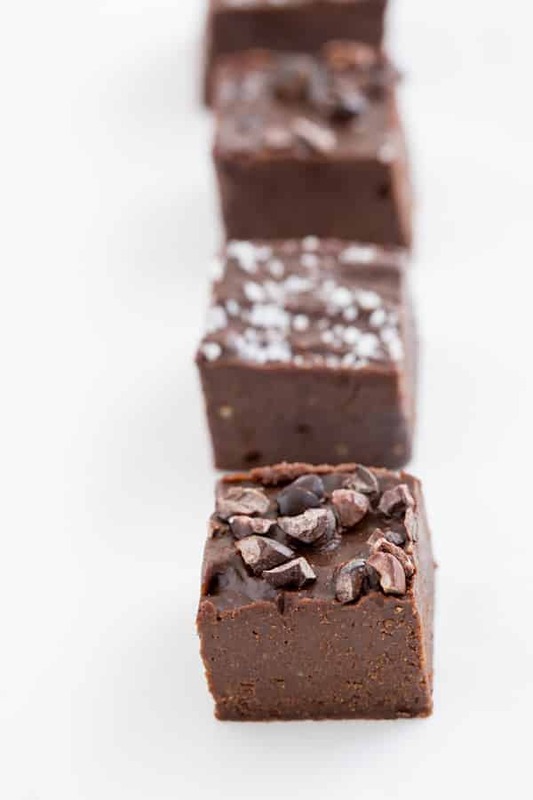 Refrigerate until solid, then remove the fudge from the baking dish and cut into squares. 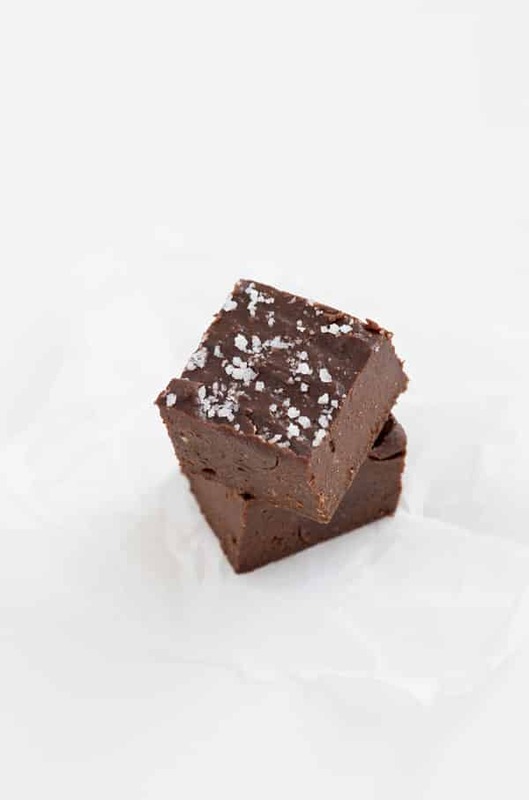 Store the fudge in an airtight container in your refrigerator or freezer. If you freeze it, let it sit at room temperature for a few minutes before serving.